How long and how big of area does Roomba able to run for each full charging? Roomba can run around 90 minutes, depends on the size of your house and the furniture allocation. It usually can cover an area of around 1,000 – 1,200 sq ft, but it will be less if more obstacles which will consume battery power. How long is Roomba’s (battery) charging time? First charge and refresh charging time is 16 hours. Afterward, a full battery charging time is 3 hours. What is the battery type for Roomba? Roomba is offering Nickel metal hydrates battery and using sophisticated Extended-Life Power Management software to delivers hundreds of cleaning cycles if under proper use. How can the wall edges & corners be cleaned? Roomba has a 3-arms side brush which is able to clean debris from wall edges and corners. Roomba can work on which floor types? Roomba can work on multi floor types including wood, tile, vinyl and linoleum, hard floor and carpet. What is 3-cleaning stage process? Side Brush cleans debris from wall edges and corners. Counter-Rotating Brushes reach deep into carpets and clean on hard floors. Vacuum removes dirt, debris, pet hair, dust and more. Can Roomba climbs over carpets and thresholds? Roomba climbs over carpets and thresholds automatically without impacting its performance in the process. It can get across a threshold less than 2cm height. Roomba never uses a random method to cover the floor. It uses iAdapt™ Responsive Cleaning Technology, which is an advanced system of software and sensors that actively responds to the environment to make smart cleaning decisions in the real world. iAdapt™ Technology is the most actively intelligent robotic technology, intuitively monitoring its surroundings over 60 times per second and responding in real time with over 40 different behaviors. iAdapt™ Technology is sensory-based and not map-oriented, Roomba is exploratory in its methods and more thorough in its result. Will Roomba get stuck by cables or rugs? Roomba has an anti-tangle technology. When it senses getting catch up by cables or tassels, it will stop and then reverse away safely. Does Roomba able to clean under furniture? Yes, it can cleans under those furniture such as beds and couches with 9.2cm away from the floor (Roomba’s height is 9.2cm). Can Roomba wash or mop the floor? Roomba is only vacuuming robot, no wet mopping function. Only Braava 380t is compatible with the Turbo Charge Cradle. Braava comes with a rechargeable Nickel Metal Hydride battery. You can charge this battery even if you have not run it all the way down to a low battery signal. When charging, Braava can either be removed from the charger once it is fully charged or it can be left on the charger. Use your NorthStar cube for maximum coverage. Braava can clean farther and smarter with the Cube, but can still clean without it. If the Cube is not present, the robot will clean a smaller area and cannot perform a perimeter clean at the end of its cycle. Avoid interference from other home appliances. How do I decide which Roomba is right for me? From starter models to premium offerings, there is a Roomba that is right for your home and your lifestyle and we’re happy to help you find it. If you prefer Roomba to clean when you’re not home, all 700 Series models offer on-board scheduling. 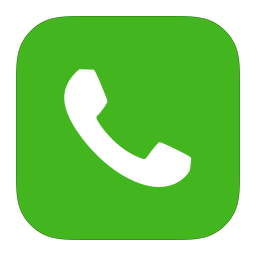 If you need help making a decision, just give us a call. Have you implemented any new navigation technologies in this series? Some of your competitor’s robots seem to be more technologically advanced in their navigation methods. Did you think about implementing these into the 800 Series? As with the 500, 600 and 700 Series, the 800 Series moves about the room using our highly successful and extremely effective iAdapt® Responsive Navigation Technology. With iAdapt Technology, our robots use over 40 robotic behaviors and make more than 60 decisions per second to ensure that they clean every section of the room, making multiple passes over every area. This adaptive cleaning technology is what works best in the real world, where dirt doesn't fall in regimented rows and a bed skirt isn't the ultimate roadblock for dust. Our robots clean the way you would –thoroughly and efficiently. We’ve investigated and patented several other methods of navigation for our floor cleaning robots, but ultimately we selected and continue to use the most effective method of navigation to clean the floor – iAdapt Responsive Navigation Technology. Can I use my old accessories with the Roomba 800? The Roomba 800 Series is compatible with past series’ Virtual Walls, Virtual Wall Halos and remotes. Can I upgrade my previous Roomba series model to AeroForce? 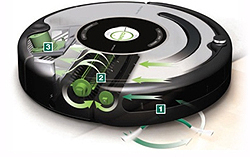 AeroForce is exclusively featured in the Roomba 800 Series; most of the 800 Series service parts are not compatible with past generations of Roomba. Dual counter-rotating extractors incorporate a durable polymer tread design that grabs dirt and debris from any floor type. The AeroForce™ Performance Cleaning System uses a combination of three breakthrough technologies – Tangle-Free Debris Extractors, an Airflow Accelerator and a High-Efficiency Vacuum – to deliver more cleaning power and less maintenance hassle than previous Roomba generations. What is a Virtual Wall Lighthouse? The Virtual Wall® Lighthouse™ allows Roomba to vacuum from room to room. The Lighthouse contains Roomba in one room until it is completely vacuumed then directs Roomba to clean the next room. A Lighthouse can also block off-limit areas. The Remote Control lets you conveniently access Roomba’s functions. Use it to turn Roomba on and off or steer it around your room. It also gives you remote access to tell Roomba to spot clean or return to its dock. Make sure there is a direct line of sight from the remote control to Roomba and that the remote is pointed at Roomba. The best way to prolong the battery life is to frequently use your robot and keep your battery charged. Also, keeping the extractors and filters clean allows Roomba to use less battery power with each cleaning cycle. To maximize cleaning performance, be sure to check the filter after each cycle. Simply remove the filter and tap it against your waste basket to release the trapped dust and debris. Be sure to replace your filter every two months. Never use water to wash the AeroForce® High-Efficiency filter. Roomba will continue to clean with a full bin but less effectively. For optimal performance, empty the bin frequently. To help with the maintenance process, Roomba 880 will automatically notify you when the bin is full and ready to be emptied. Room cleaning time ranges from 14-75 minutes depending on the model and room size. Decreasing the amount of clutter in the room will help lessen this time and improve cleaning effectiveness. What cleaning solutions can I use in my Scooba? As with previous Scooba generations, Scooba cleans effectively with water or iRobot Hard Floor Cleaner for a deeper clean to wash away up to 99.3% of bacteria. * iRobot Hard Floor Cleaner is specially formulated for use in robots. Use of other cleaners can reduce robot mobility or functionality, and will void the warranty. * When used as directed with iRobot Hard Floor Cleaner, laboratory testing results indicate removal of Escherichia coli and Staphylococcus aureus bacteria after two passes of the Scooba Floor Scrubbing robot. Individual results may vary. What floor surfaces are safe for use with Scooba? Scooba is safe for most hard-surface floors, such as tile, linoleum, stone and sealed hardwood. If you would use a mop to clean your floor, Scooba can clean it for you. How does Scooba help me get rid of bacteria in my home? Scooba works by scrubbing away stuck-on grime and then squeegee-vacuuming it off your floor. Just empty Scooba’s tank, give it a quick rinse and enjoy a clean floor. Why should I use a robot instead of a mop? Scrubbing is a tedious, unpleasant job that doesn’t get done as often as it should. Scooba 450 is the only robot that scrubs hard floors so you don’t have to. Just fill the tank, press CLEAN and it automatically sweeps and pre-soaks, scrubs and then squeegees floors, washing away over 99.3% of bacteria. * Scooba 450 is the perfect choice for brilliantly clean hard floors, the easy way. What if I don’t want Scooba to run for 40 minutes? Scooba is programmed to clean up to 150 square feet in 20 minutes. Cleaning a larger area in the ‘small room’ setting will result in poor cleaning performance. In addition, stopping Scooba’s cleaning before it’s finished will interrupt the Squeegee Cycle, leaving excess water on the floor. To prolong the life of the battery, always keep your robot plugged in. Use the Scooba DryDock™ Charging and Drying Stand to easily and compactly store and charge your robot while the active drying system keeps it fresh and dry. Select the appropriate room size setting for the space the robot is operating in. The small room setting will clean up to 150 square feet, while the large room setting will clean up to 300 square feet. 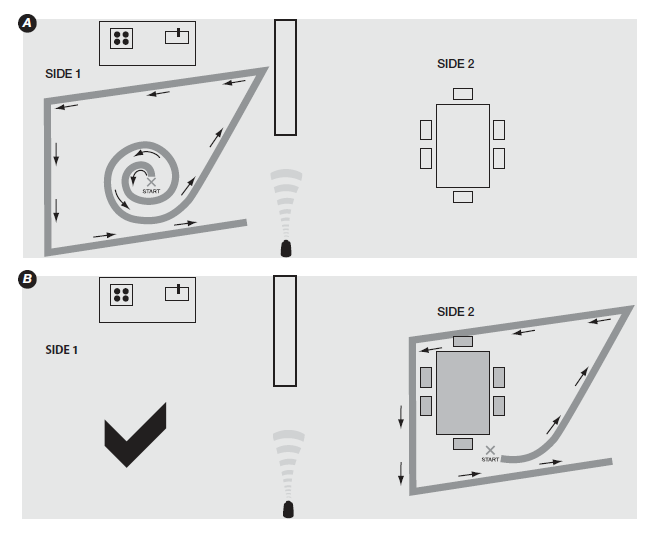 Minimizing clutter and moving chairs will help your robot navigate best. You may also want to use a Virtual Wall to section off parts of your space. Remember that at floor level, a room sectioned off by a peninsula looks to the robot like two rooms separated by a doorway, like pictured below. After each use, empty and rinse the clean and dirty water compartments of the tank, and remove and rinse the cleaning head. Periodically remove any hair or debris buildup on wheels and brushes, or as directed by the robot.